Acronym for United States Navy. 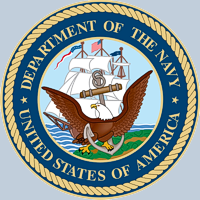 The USN is managed by the Department of the Navy, which is headed by the civilian Secretary of the Navy. The Department of the Navy is itself a division of the Department of Defense, which is headed by the Secretary of Defense. The highest ranking Naval officer is the Chief of Naval Operations. Its mission is to maintain, train and equip combat-ready Naval forces capable of winning wars, deterring aggression and maintaining freedom of the seas. In 2007, the U.S. Navy joined with the U.S. Marine Corps and U.S. Coast Guard to adopt a new maritime strategy called A Cooperative Strategy for 21st Century Seapower. The strategy calls for the Navy, Coast Guard and Marine Corps to work collectively with each other and international partners to prevent crises from occurring, or reacting quickly should one occur. In 1947, the U.S. Navy began Project Skyhook, a program that used large unmanned polyethylene balloons to carry research payloads up to altitudes of 30 kilometers. Skyhook eventually became a very successful program, and its technology was also used by the Air Force. Immediately after launch, Skyhook balloons formed a gas bubble at their top with a long non-inflated strand of material below. As the balloons rose to high altitude, the lower air pressure allowed the gas bubble to expand, eventually filling the whole balloon, which could become more than 30 meters in diameter. Consequently, some Skyhook balloons were mistaken for UFOs, and several that were lost were found by monitoring incoming UFO reports across the North America.